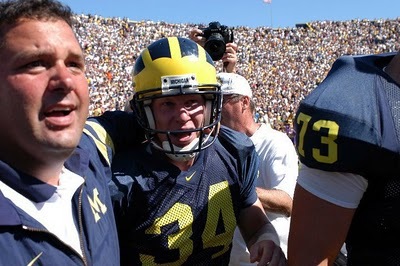 Brady Hoke congratulating Phillip Brabbs after his game winning FG against Washington in 2002, our last win over a Pac-12 school. The agreement between the Big Ten and the Pac-12 to begin officially scheduling non-conference games between the two leagues for all sports, not just football, won't get underway until 2017. However, that's not stopping Michigan's Dave Brandon from pursuing Pac-12 teams for schedule openings in football for 2014, 15 and 16. Michigan is in the process of wrapping up deals to play Pac-12 teams in the next few years. [Brandon] hoped announcements on future games would come in the next week or so and that he was just waiting on contracts to be signed. "I figured that as long as we're going to have an affiliation with the Pac-12, we ought to pursue it and see what we can do to create some matchups before the official 2017 start," he said. "So we're working hard to do that." The games would come before the 2017 series began, and Brandon said he's leaving dates open for that year and beyond for a Pac-12 opponent. "As far as the big matchups between the Pac-12 and Big Ten, the conference is really going to coordinate all of that," he said. "But I've got games to fill (in the next few years), so we'll do some of those." The one thing I take away from this statement is that Brandon wants Michigan to have as much control, and especially leverage, as he can get prior to the 2017 start to this series. In a way, it's a power move. But it's also smart on Brandon's part to assume a lead role in this before things really take off. And given how the conference landscape could be shifting dramatically in the coming years, ADs will take as much leverage as they can get – even if the B1G and Pac-12 are stranding themselves on an island. From a scheduling perspective, I'm all for playing teams from a BCS conference rather than directional Michigan schools. Even though Michigan is a mere 1-6 since the 1998 Rose Bowl against the Pac-12, I'll take what I can get. I'm for anything that creates a better fan experience and makes for better football.